From routine checkups to treatments for surgery,Stamford Podiatry Group, P.C. is equipped to handle all your podiatric needs. To help you understand your options, we’ve included descriptions of some of our leading services on this page. Good Bye Magic Shoes your time has served me well. Today is a brand new milestone for me. 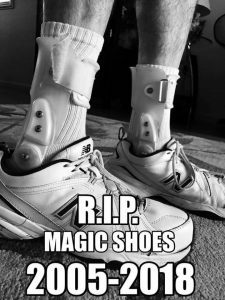 I have officially said goodbye to my Magic Shoes. Today I am a new person with two brand new arches in my feet thanks to Dr. Rui DeMelo and Stamford Podiatry Group and HyProCure. I endured my entire life with flat feet accompanied by pain in multiple joints and constant back pain. My feet and ankles would literally destroy any brace that wasn’t strong enough to correct its position and then find a flaw in the new brace and destroy that one too. I think I’ve been through 10 generations of ankle braces before finding the proper design. They say if you want to know where someone has been, just look at their shoes. My feet have stood through 10 hour shifts working in the kitchen, handling Cookie Monster in the Thanksgiving Parade 3 times and even climbed the volcano Mount Etna in Sicily. They have carried my wife through the front door on our wedding night and flew my son through the living room like Superman. I’m looking forward to no more pain. I’m looking forward to walking on the sand without sneakers and leaving a footprint. I’m looking forward to having defined calf muscles. I’m looking forward to see where my feet will guide me next.